Can't attend QuakeCon this year? No problem. Thanks to Twitch, you'll be able to catch the best bits via live, streaming video. QuakeCon 2013 is, ostensibly, a celebration of id Software, the developer behind such classic games as Quake and DOOM. 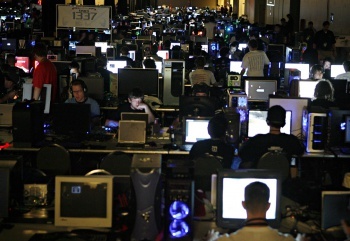 Over the years however, it has morphed into a more general-purpose gaming convention. Yes, there are still intense LAN battles, and hundreds of people who could hold an intelligent conversation on the utility of .WAD files, but now the show also features games from id's parent company Bethesda Softworks. As such, we now have Elder Scrolls titles sharing the stage with classic shooters. This would seem dissonant, but the schedule for QuakeCon released by Bethesda this morning sounds enticing. We'll get to the full schedule in a moment, but before we do, you should know that the organizers of QuakeCon have teamed with Twitch (the de facto leader in online videogame streaming) to broadcast all of the 'con's various tournaments, presentations and gameplay exhibitions. That final presentation may pique the interest of you movie fans. Hugo Martin served as a designer on Pacific Rim where he had a hand in designing that movie's Jaeger robots. Being so topical, that's the focus of his presentation, so if you dug that film, you should probably catch the Twitch livestream of Martin's presentation. "But wait, you keep mentioning this Twitch stream, but you haven't said where we can find it!" I hear a few you shouting at your monitors in frustration. You're right. Apologies. You can find all of the streaming QuakeCon footage at Bethesda's official Twitch page. If you're solely interested in the gaming tournaments held at QuakeCon, you'll also want to keep an eye on the official QuakeCon Twitch channel. That stream will feature shoutcast coverage of all three of the 'con's big tournaments. Edit: This report initially stated that only a select few events would be streaming via Twitch. We have since been contacted by representatives for the event who have assured us that there are actually two separate streams to keep an eye on. Bethesda's Twitch channel, which you can find at Twitch.TV/Bethesda, will broadcast most of the presentations and talks scheduled for QuakeCon. The QuakeCon Twitch stream (http://www.twitch.tv/quakecon), on the other hand, will focus on the event's videogame tournaments. Below you can find a full list of what you will be able to watch via the Bethesda stream, which, helpfully, we've embedded below this wall of text.